1. 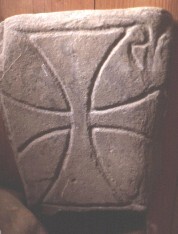 Iona, Eochoid stone cross. thought to have been a grave-marker. Original location is unknown. 0.36 m long and 0.27 m in width. Chi-rho monogram consisting of a compass-drawn cross with expanded arms, which has a small hook (the rho) attached to the upper arm. It has an inscription along the top edge of the stone which reads LAPIS ECHODI, 'The stone of Echoid'. Echoid was an Old Irish personal name; Echoid was the name of one of the traditional companions of Columba, and of several of the kings of Dal Riata. Allen, J. R., Anderson, J., The Early Christian Monuments of Scotland. , Pinkfoot Press, Balgavies, Angus (1993) Descriptions, Stone, Sculpture, Monuments, Scotland.